Barebones all the way. I will continue to update this post on the WGS reqs until I complete WGS. 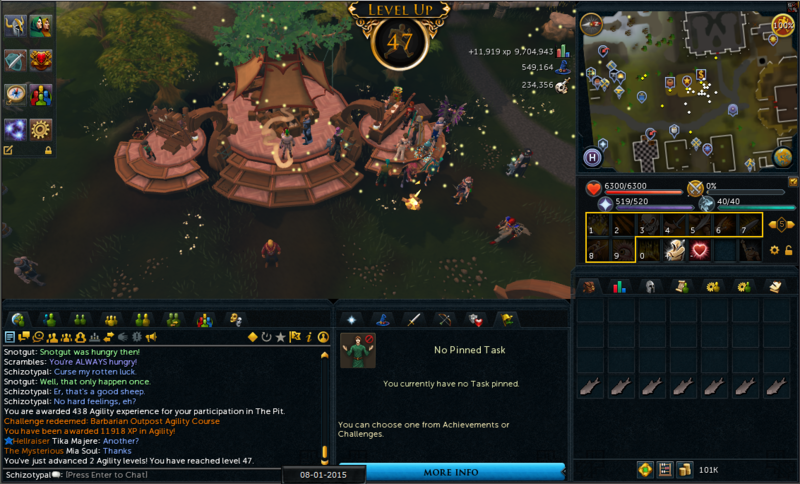 I'm Schizotypal and I'm here today because I just got srs and bought Gold membership for my ironman account. I have no clue what my plans are for the account honestly. I'm merely enjoying the journey. 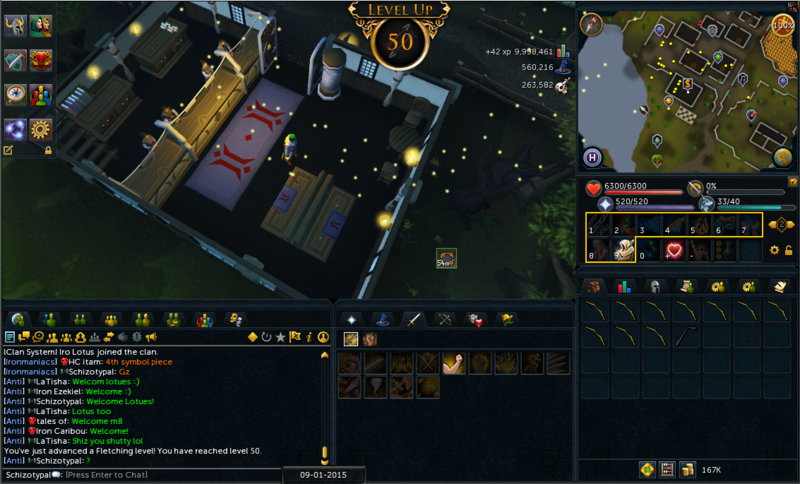 At the start of this blog my current plan is to go for both 90 Runecrafting and raise all of my skills to 50 or higher. 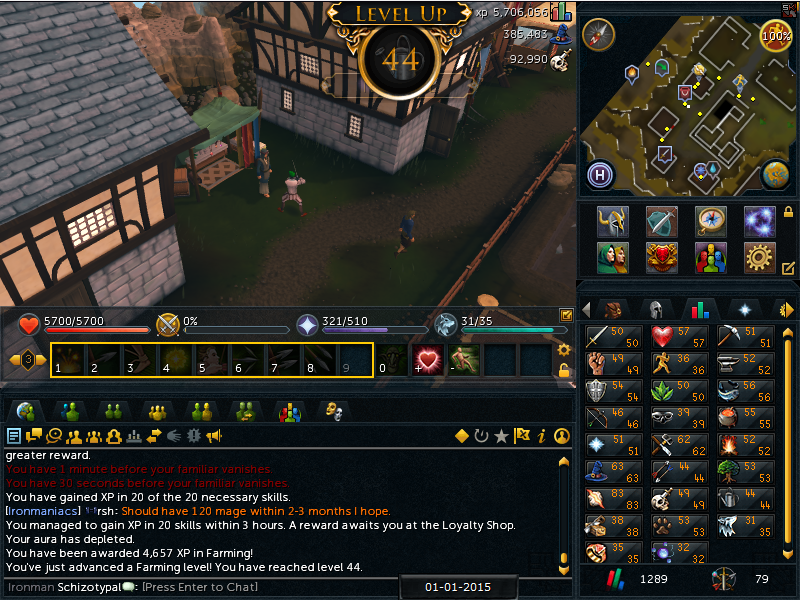 I've played Runescape for a while now. Oh and you may or may not know me as Hyoro/Archdemonz18. 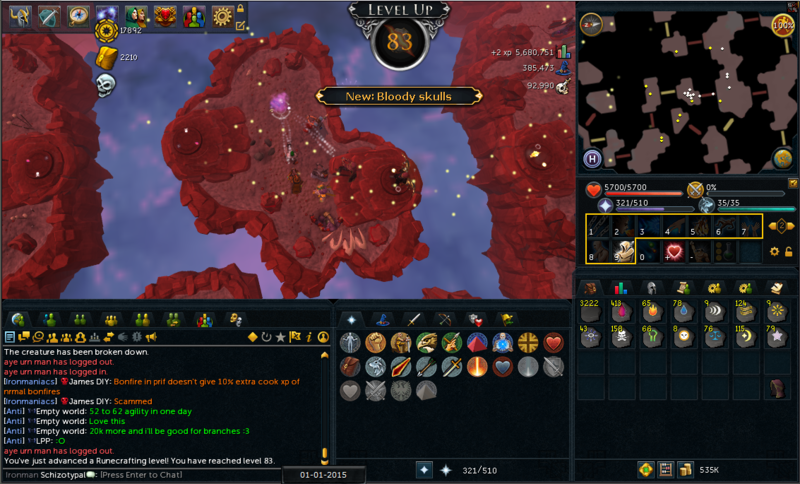 Around December 17th, 2014 I reached a total level of 826. 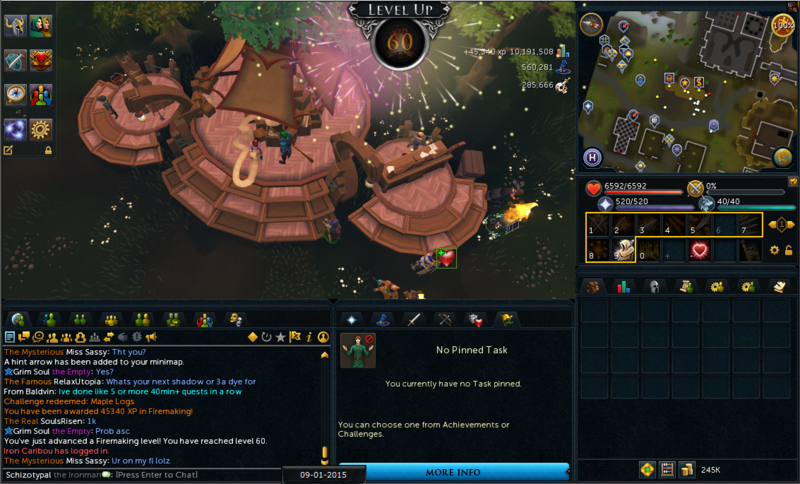 I took a break recently from Runecrafting to work towards 50+ all. I'm about 95k from 83 iirc. 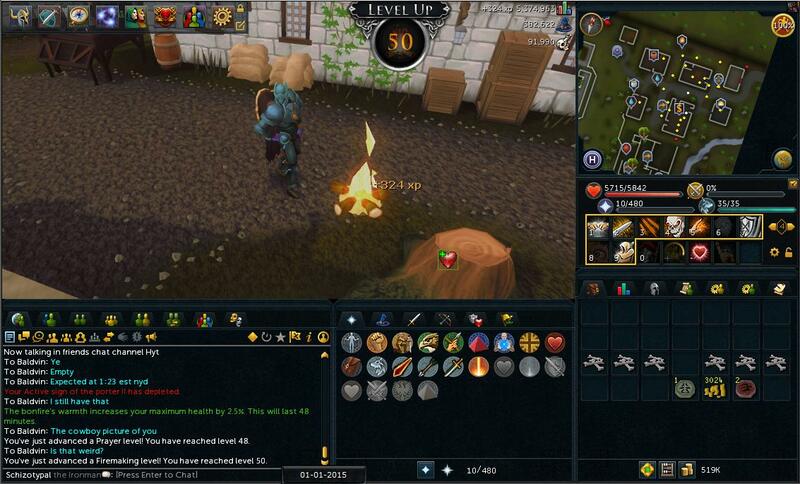 I wanted to get a Rune hatchet so yesterday I camped Steel Dragons and went from 54-60 magic with no dice. 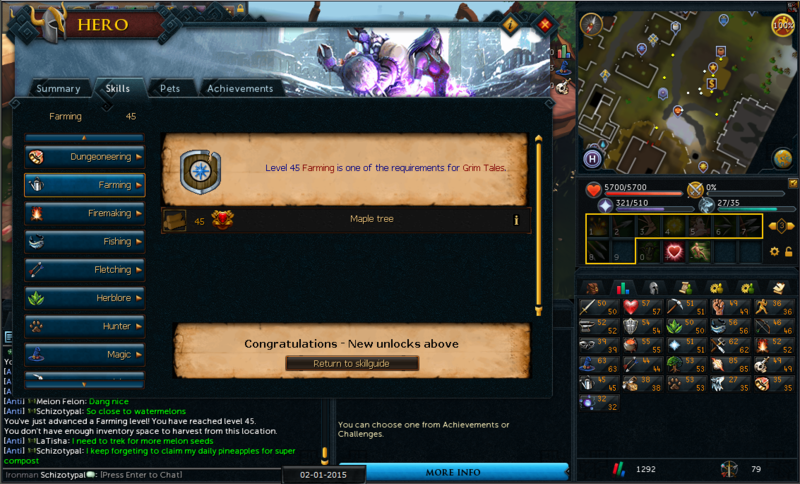 So tonight I plan to go kill Rex to try to get a rune/dragon hatchet. 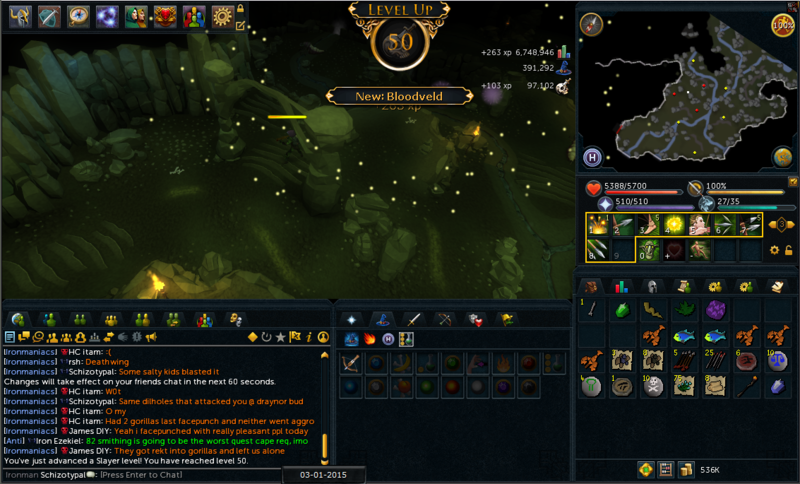 I have my godstaff and plan on heading there after my current slayer task. 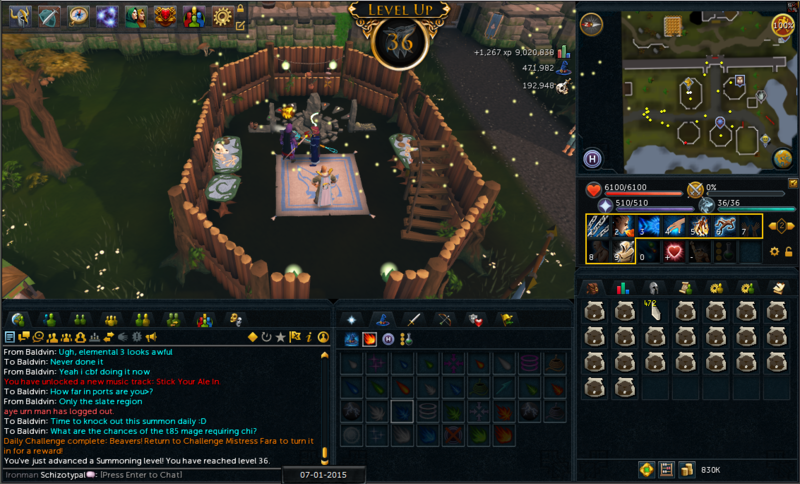 My account goal atm is to complete While Guthix Sleeps. Probably forgot a few things but (shrug). Currently I'm collecting 300 green dragonhides for a 300 vamb challenge. 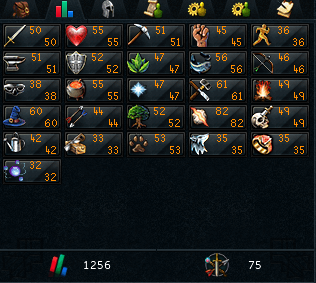 I have 241/300 hides banked atm. Using porter II to bank them. 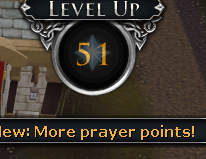 I should get 50 Prayer from burning all of the bones and 49 or 50 strength from it. 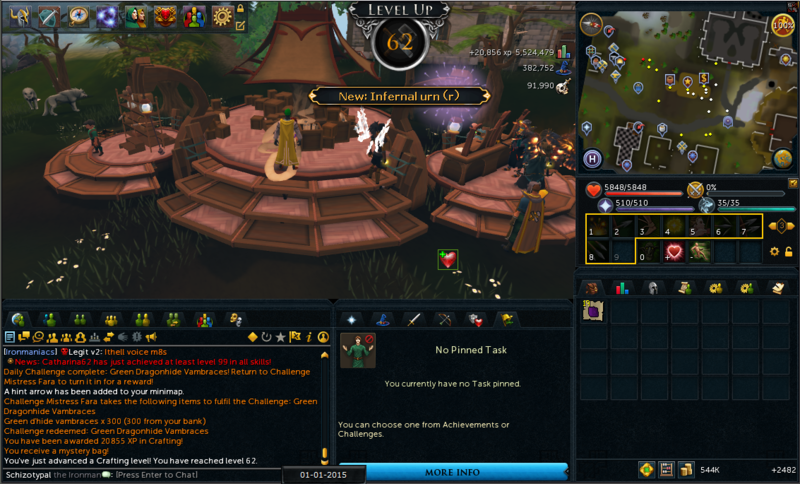 The vambraces will get me close to 62 but we'll see how the xp goes. I also have a thieving from Cave Goblin daily I'll probably churn out tomorrow. 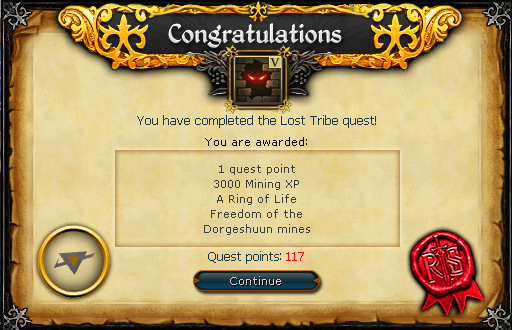 I need to do The Lost Tribe and the goblin quest after that, don't remember the name. I'll probably do Heroes tomorrow as well. Then I'll have access to dual dragon maces and another requirement off of Legends. Finally finished my 300 vambrace challenge. 20.8k xp. Not bad but the dstone reward is really nice. After a few magic levels I can enchant drings for a ring of wealth. Picked up South Park: The Stick of Truth. 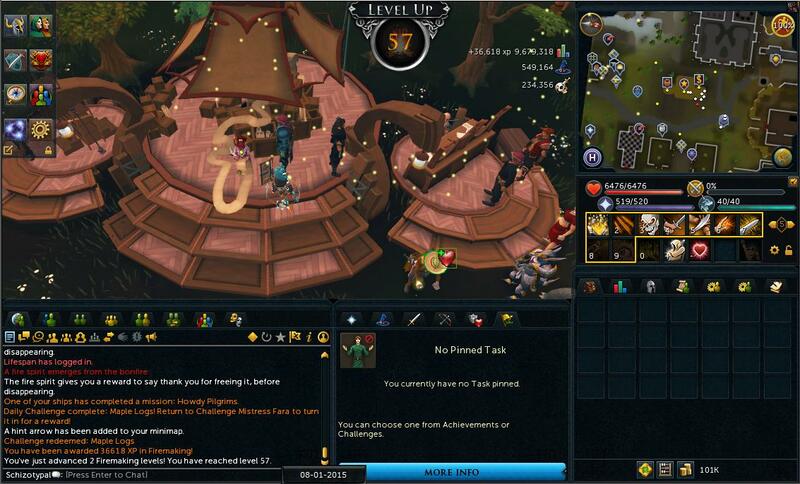 So I'll play that for a bit then go and do some questing. So I did plan on the lost tribe/heroes but I got sidetracked and just went down the list on filter. 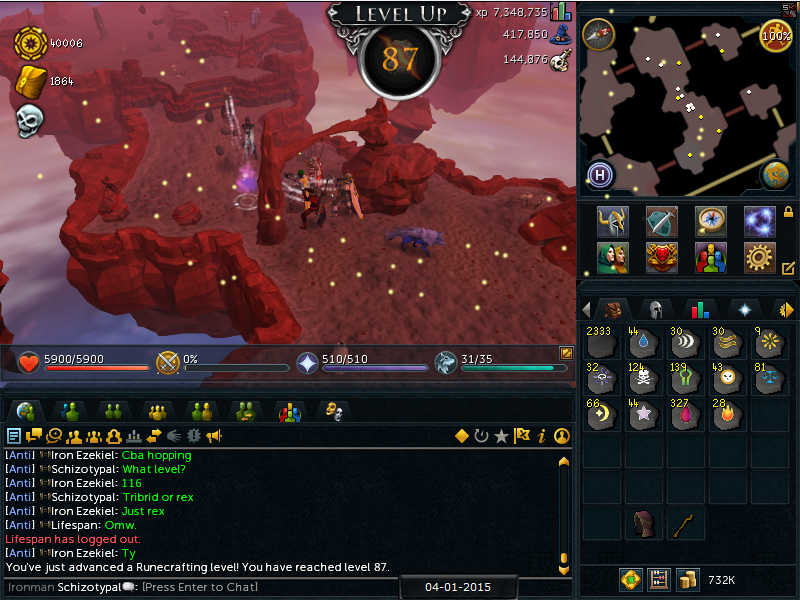 1287 total as of right now. 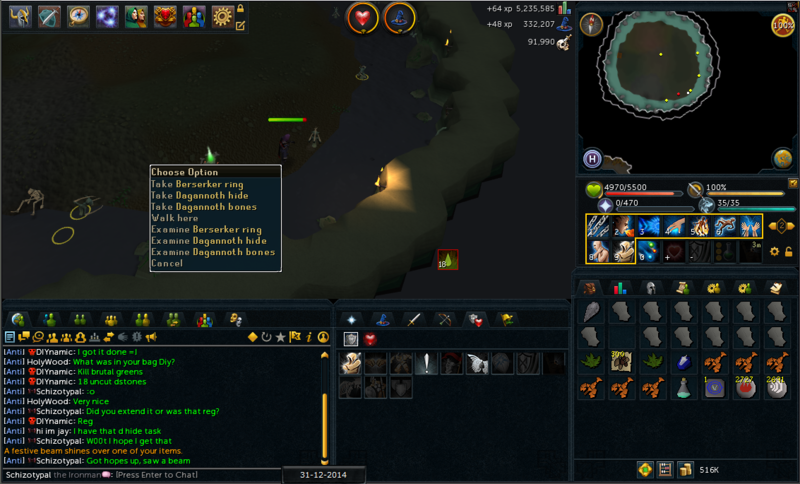 Missed a HP screenie and Slayer. 58 Hp, few range levels. And Dent speaking words of wisdom as always. 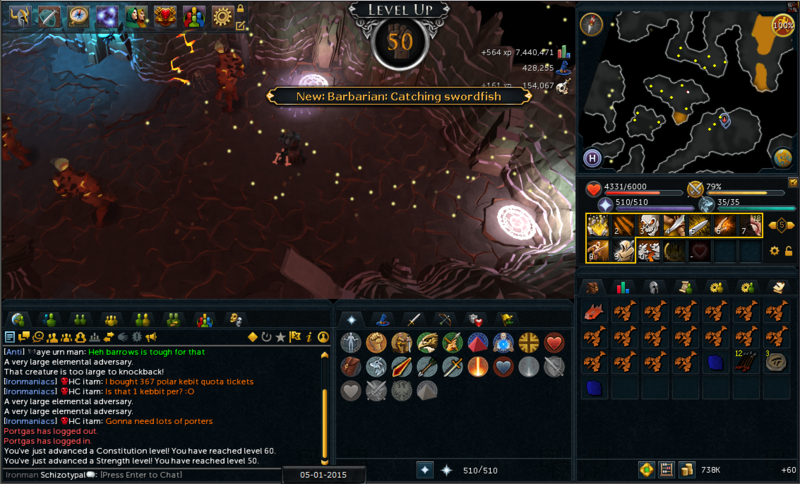 Double 50 Str/60 Con. Yet another Legends' Req down. The next quest today is probably going to be The Dig Site. It's the next doable quest on my list, followed by Elemental Workshop III iirc. 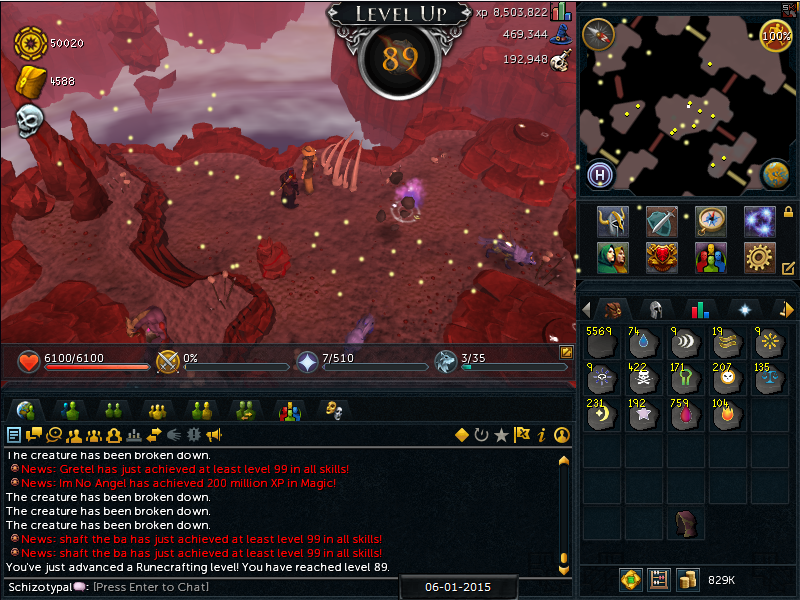 Hopefully I'll nab 88 rc today which means 3 days until I unlock Ports and Greater Runic Staff. 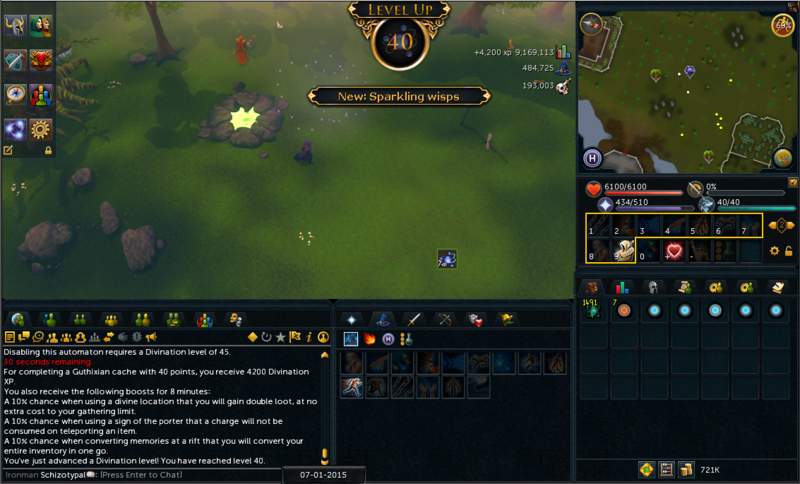 I already have 40k points so I have the pouch and the staff banked. I've reached 47 farming which allows me to plant watermelons. Now I'll begin using my Supreme Jack of Trades on Herblore now. As far as skills go, I'd like to start all quests with the requirements. Like Fairy Tale pt 2 - I can start it anytime but I'd like it when I have the requirements. 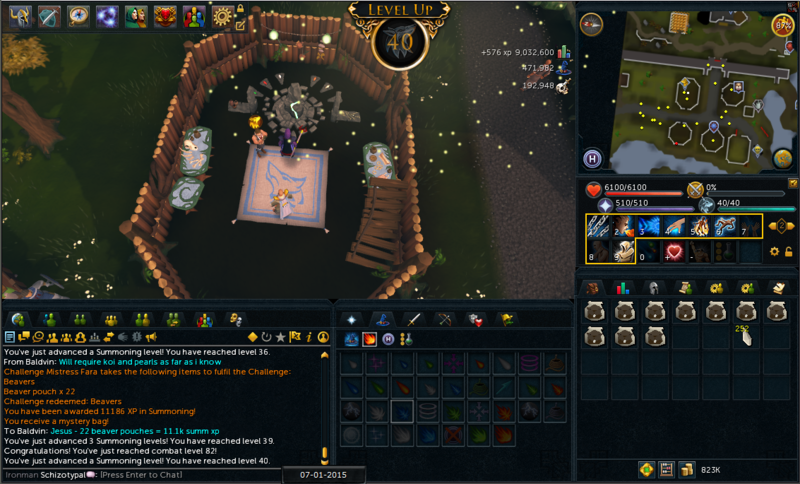 49 Farming/57 Herblore are what I'm missing. 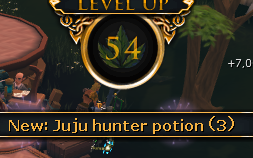 As far as gear goes, I'll be training hunter whenever I get 60 ranged and a ranging task. 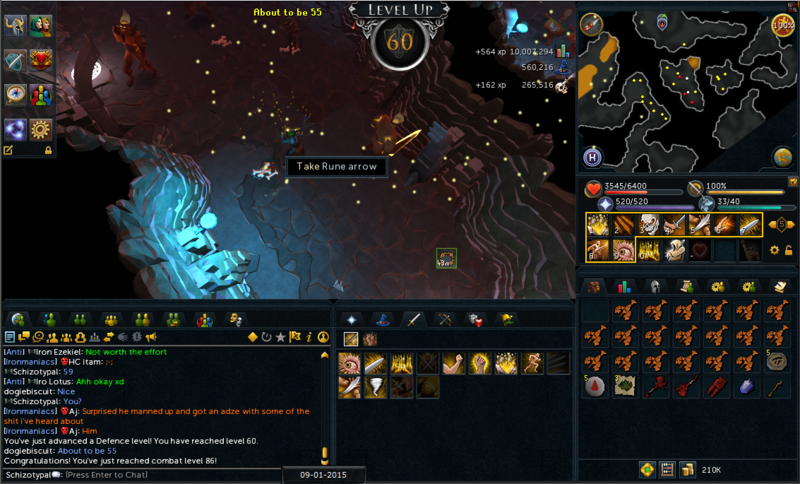 I'm 53 atm and 59 are Red Salamanders. Right now I'm working on Farming for my next 50 and trying to get charms for summon. I still have troll invasion to do so I'm pretty pumped. Going to leave that for the last part of the month. 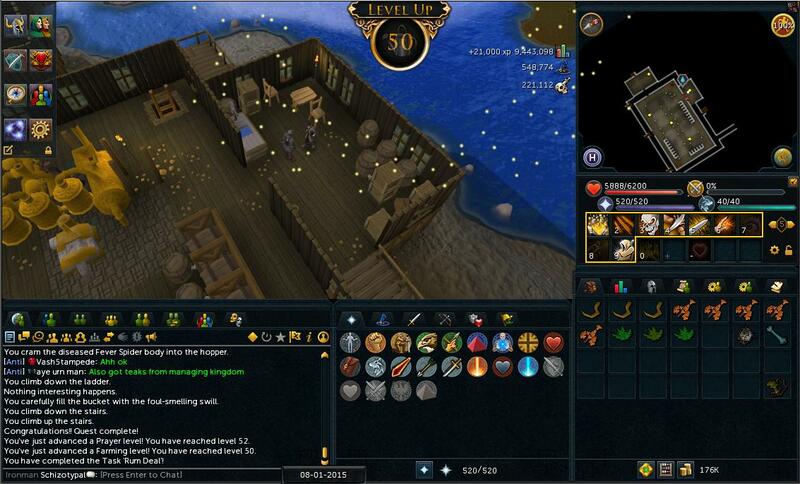 Once I get 60 defense I'm going to attempt to do some barrows runs. I also really don't want to do Legacy of Seergaze until I can do Branches of Darkmeyer due to Vyrewatches being in trekking (which I go to do for my watermelon seeds). Silver sickle is barely covering the vampyre juveniles but I make sure I use a shield to do extra dmg. 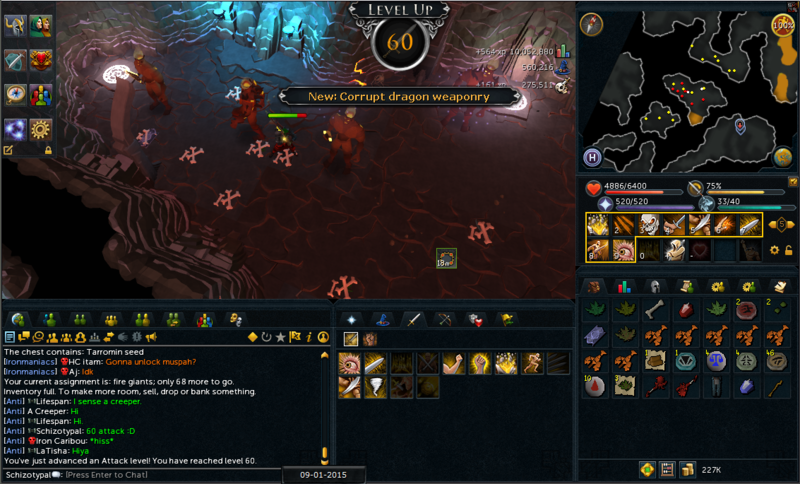 As far as gear for combat goes I was thinking of; Dragon Maces/Daggers for 60 attack. God Staff for magic, and Red Sally. For the 70s I'll attempt to use a Black Salamander, Crystal Bow, Greater Runic Staff, and some melee barrows item. 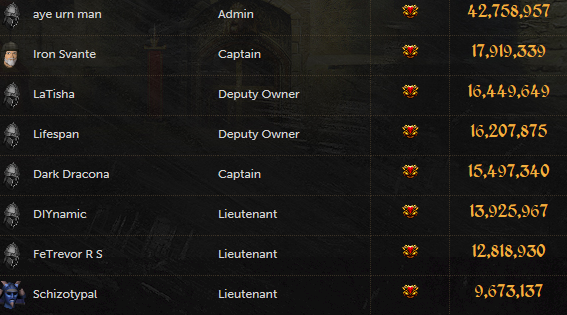 As soon as I can kill Spiritual Warriors I'll be there camping for warpriest. 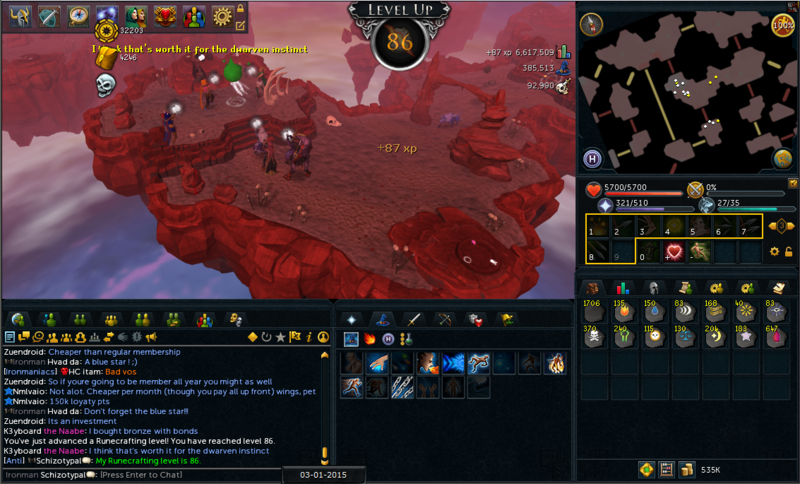 So I left during my fire giant task last night for bed. 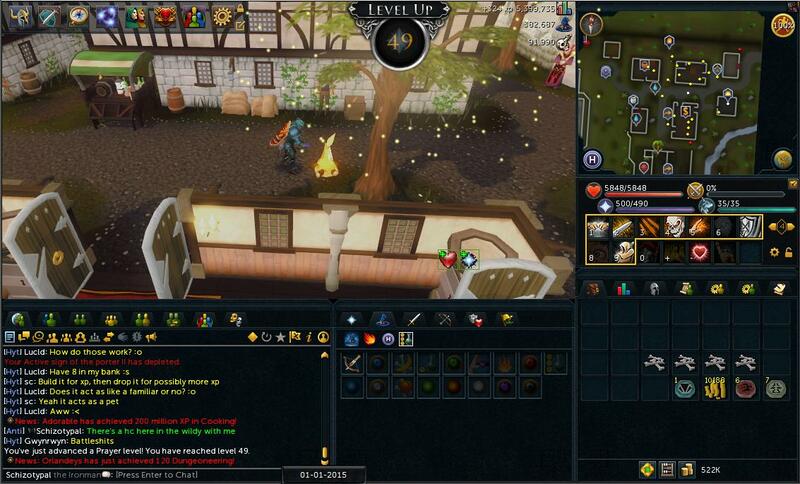 Got some lovely cb xp. So I decided ~in the heat of the moment badadada badadada in the heat of the moment~ to just finish off Runecraft. Since I'm only 939k xp off of 90, I'll continue runecrafting tonight and hopefully get around 600k to a level, and finish it off tomorrow. 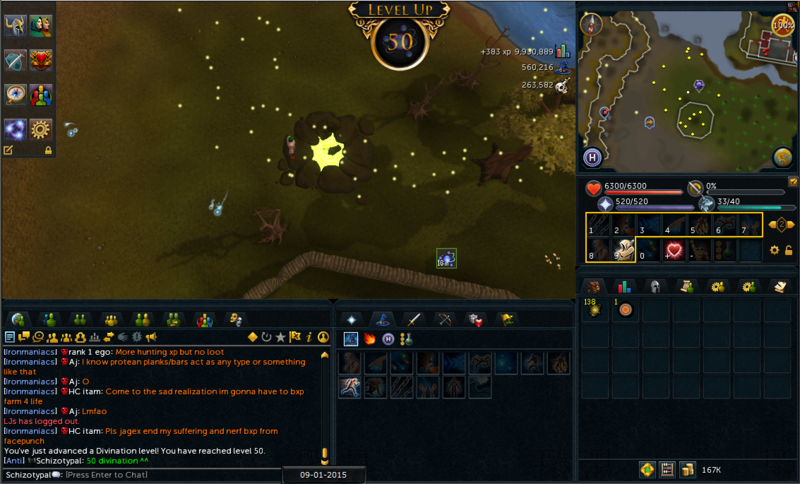 Then I'm done with runespan and I can actually work on gaining some total levels and focus more on questing/50+. 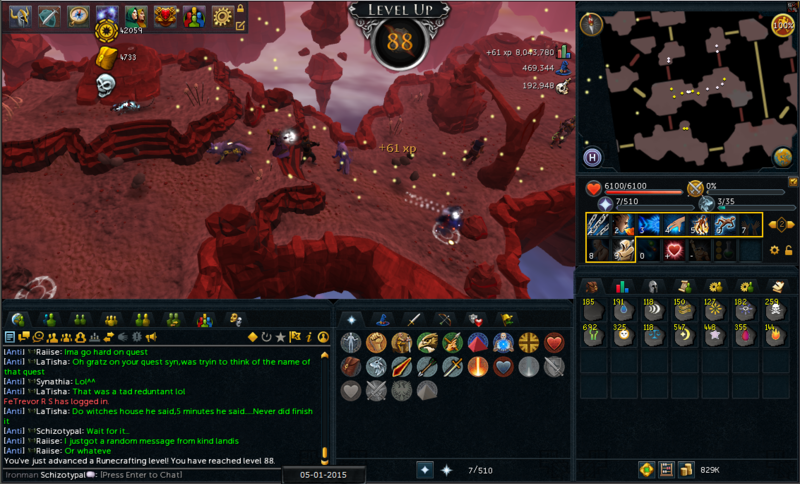 As of the time of this post I'm 860k from 90 Runecrafting. 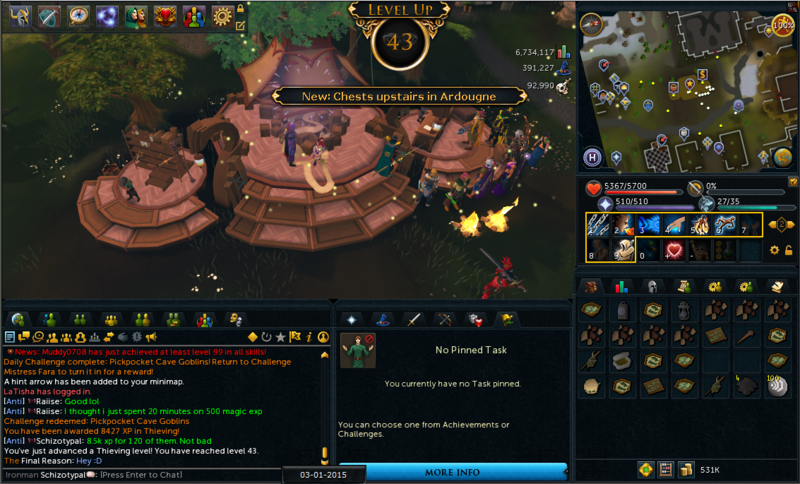 Got a daily runespan challenge and I extended it. With the help of Vis Wax I did 3 Supreme JoTs for Runecrafting. 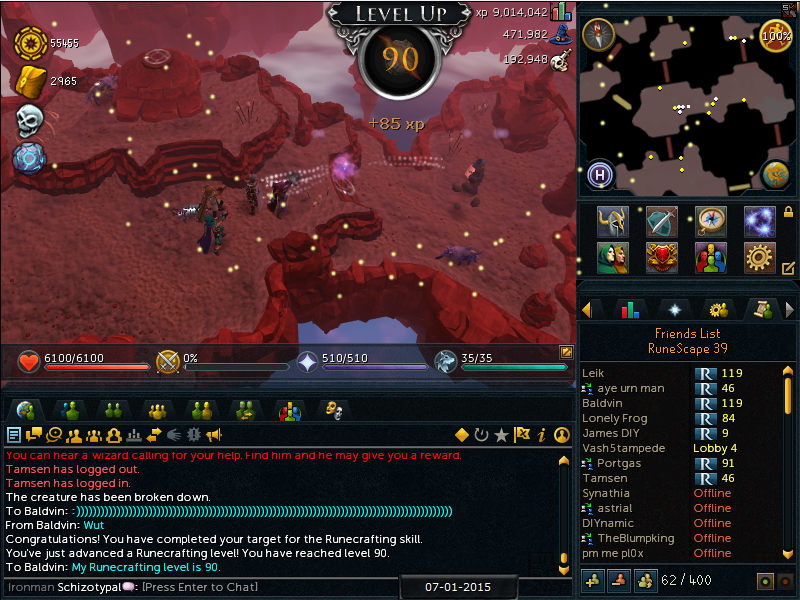 I also did troll invasion and put that into Runecrafting. 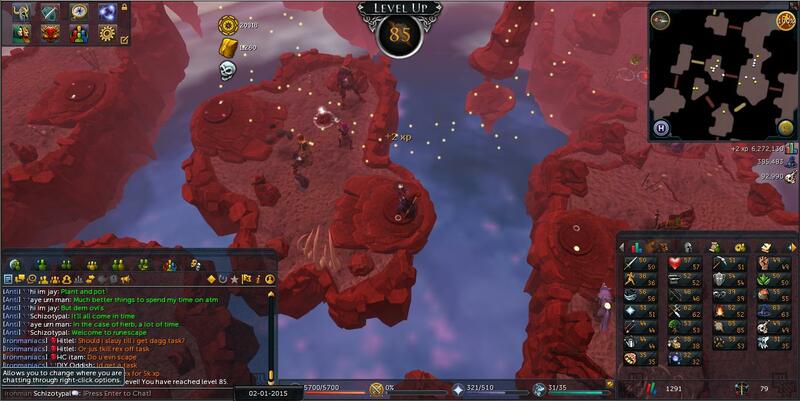 If it hasn't become clear, I'm hellbent on getting 90 Runecrafting tonight so I can staph and do my dailies (Summon daily - extended) and begin questing seriously. I have about 47 quests that I have stats for I'd like to do. Then I can work on Ports/50+ all. 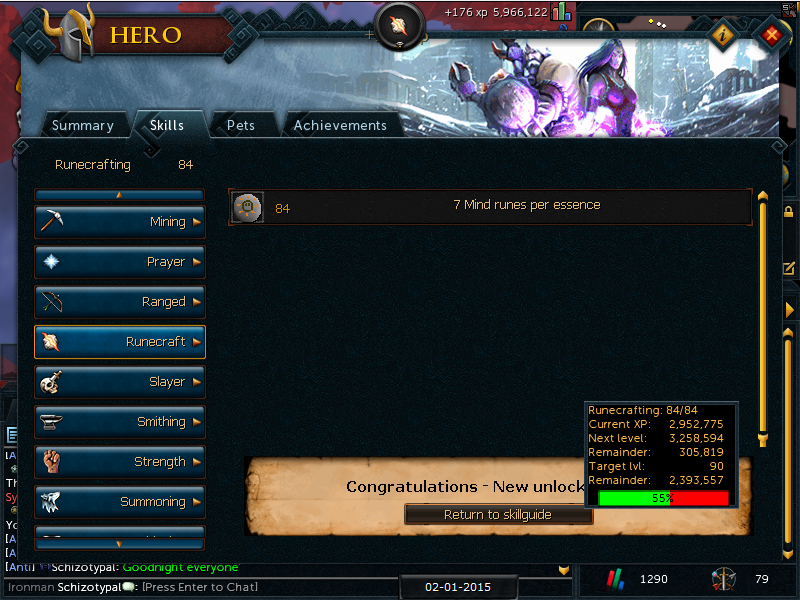 I have enough points for a Greater Runic Staff. Going to pick up some Massive Runecrafting Pouches. Meg came through and gave me a huge con lamp. 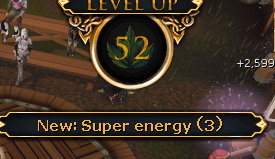 I was under 570 xp to level so that means 10 beavers can get me a summon level. 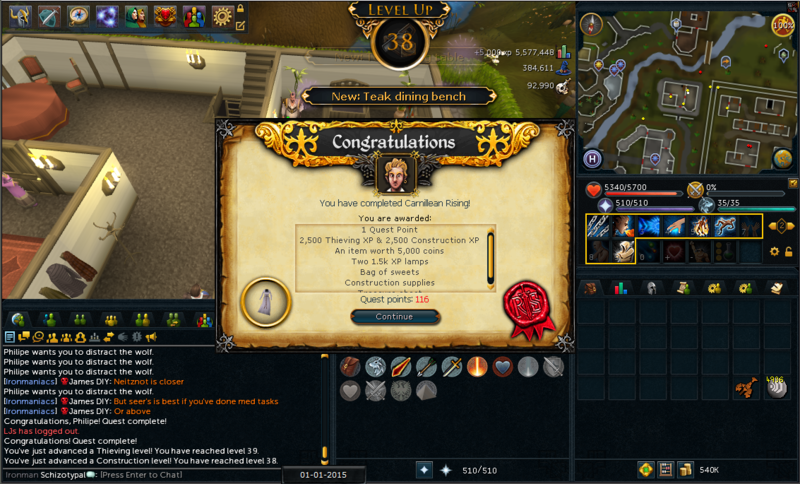 I did a fishing challenge as well which was to start 3 Strong Fishing Urns. The challenge itself netted me 9.5k xp and I reached 57 fishing. Almost to Swan Song Req. Tomorrow I'll finish up my Hunter challange which is to catch 22 Razer-backed Kebbits. I then have a dg daily so I'll do that as well. It might get me 40 dg. I should do the Bar Crawl for both Horror from the Deep and access to the Barbarian Agility course where I can do 38-40 agility. 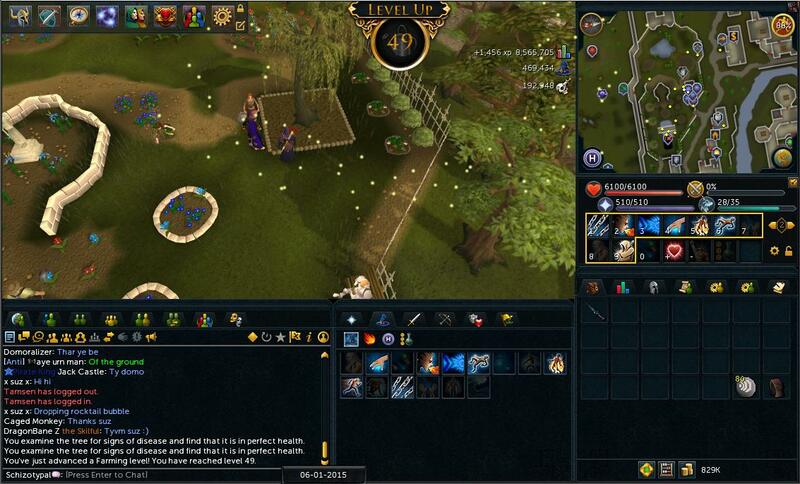 That would leave me with just 32 divination for 40+. 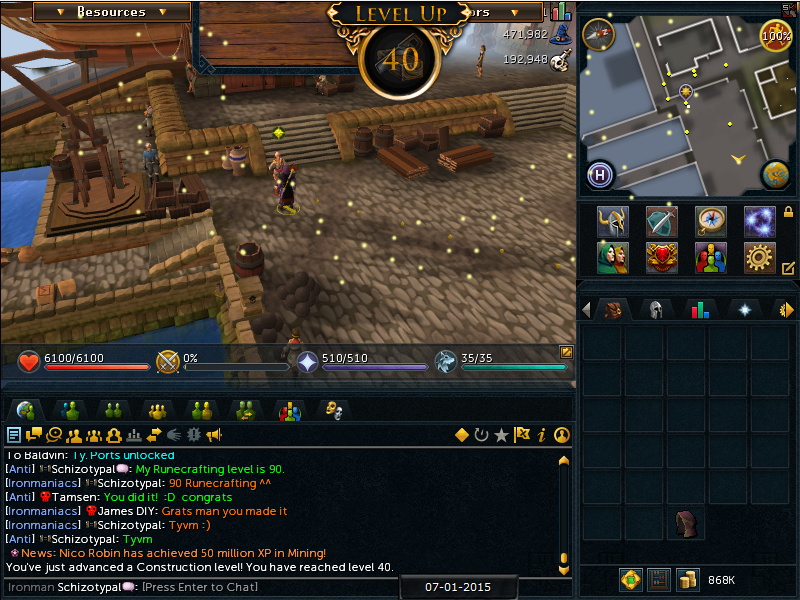 If I decide to do those tomorrow then I'll net 40+ and begin to work on questing. Few nice little things accomplished today. Look ma! I can play with dirt! I think today is a fairly large update/progress. Not sure. 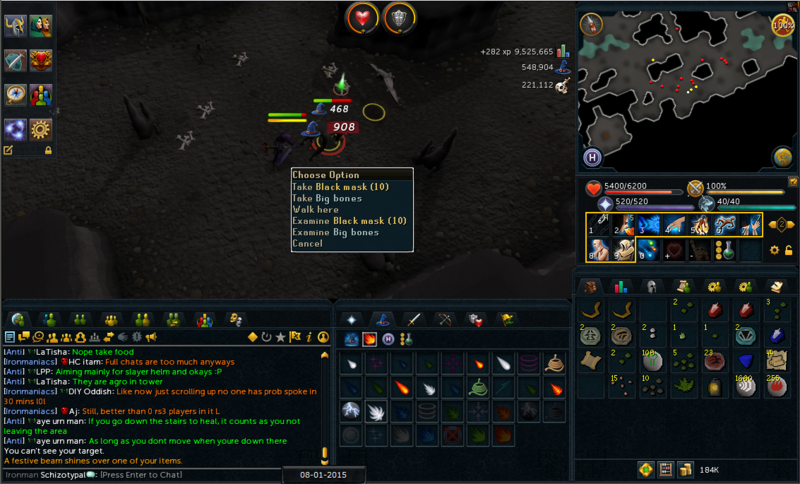 Only took 201 kills surprisingly. 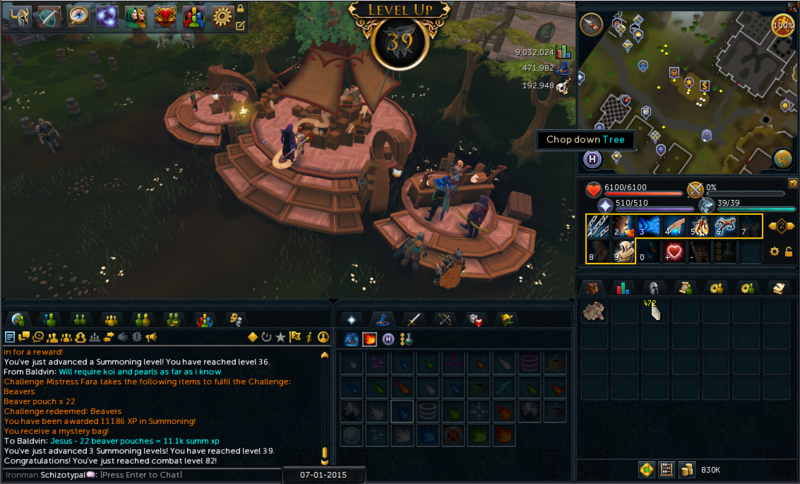 Now I can use my maples from kingdom to continue to train fletching. Strangely enough fletching is holding back a number of quests for me alone. 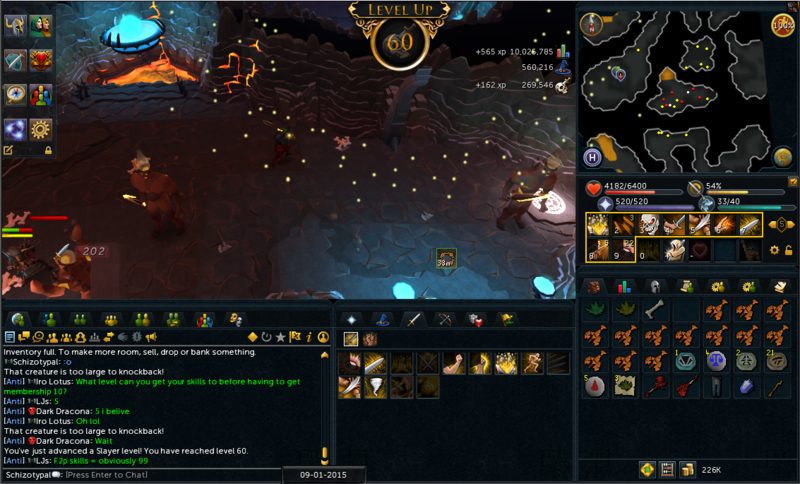 Woo another 60. 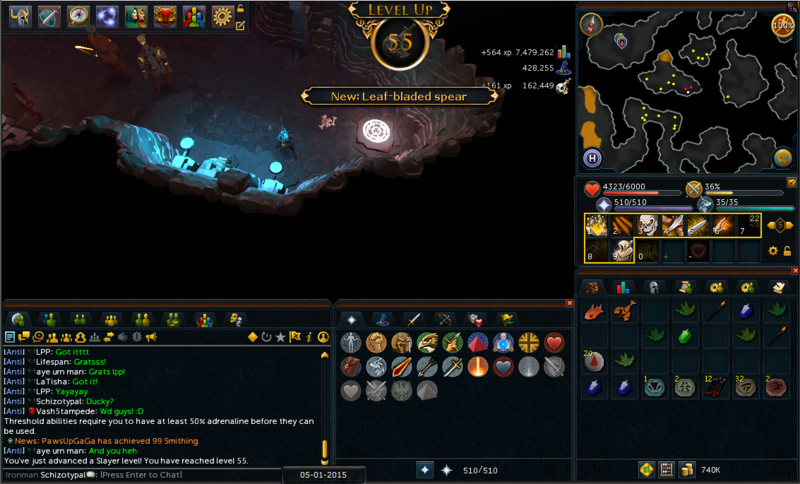 Haven't got a spectre task yet sadly. I had a maple burning daily yesterday and got another today. So I'm quite surprised but I'll take it. I need the Firemaker's Curse to unlock automatons anyway from TWW. I'm not one to diss puzzles, but this quest was stupid. Like reading the manual for it literally told me nothing. I couldn't have figured this out (I could but it would have taken far to long for me to do it) without a guide. I do enjoy the story behind why all this is being created between the master and apprentice. Now as much as I disliked 3, I really enjoyed 4. The cosmic puzzle is the puzzle that I've had the most fun with in runescape. It was pretty easy but I liked that the further you got the more you had to watch out for potential errors if you did one line at a time etc. The chaos puzzle was pretty bland imo. But better than 3 still. I think I'm one craft level away from a Branches of Darkmeyer requirement. 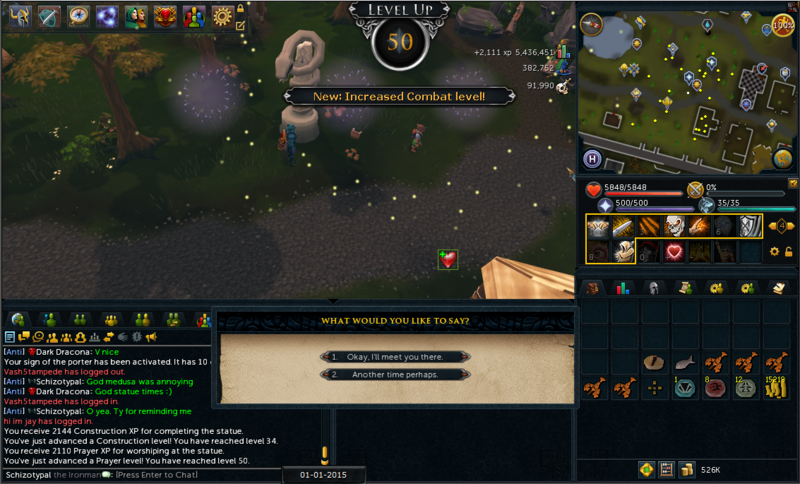 I know 54 smithing is for Defender of Varrock which is for WGS. Tomorrow if I'm feeling up to it, I'll pelt out a few more quests. I should unlock fairy rings tomorrow for sure. Then I have 52 farm atm in tree/fruit trees growing which I paid to protect. So once I'm 53 farm I'll finish up the requirements for pt3 so I don't need a staff for travel and my patches are forever weed free.